The Creative Assembly has unveiled what PC gamers will need to run its latest game of high detail conquest. The Total War games tend to be rather large scale affairs. A single battle can involve armies with thousands of soldiers that the player, in turn, can zoom in on to admire as they clash. With the combat involving so many moving, highly detailed parts, you'd probably be correct to assume you'd need some processing power to back the game up. 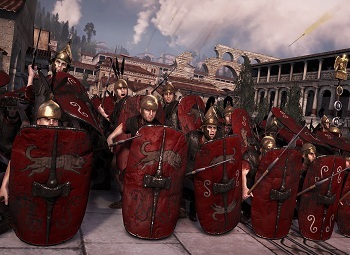 Now, to help franchise fans prepare for the heavy load of the upcoming Total War: Rome 2, the game's developers, The Creative Assembly, have released the title's system requirements. With the game's hardware requirements unveiled, we're curious as to how our readers' current PC builds stack up. Personally, Total War: Shogun 2 was the game that showed me just how out date my desktop PC was. Will Total War: Rome 2 be doing the same for you, or will you manage to squeak by and stave off upgrading just a bit longer? Fans everywhere will find out when the game launches on September 3rd.